By now, you’ve probably heard the United States is in the midst of an opioid epidemic. Opioid-related overdoses and deaths are at an all-time high, partly due to prescribing practices that have changed over recent decades. Distribution of prescription opioids have skyrocketed. To make matters worse, not only are these drugs being prescribed more frequently, they are also being prescribed in too high dosages and quantities, according to the CDC. It’s safe to say that the excess of prescription drugs, especially opioids, needs to be addressed in efforts to combat this growing crisis. But why is an excess of medication such a big deal? It’s OK to keep them on hand, even if you don’t need them now, right? Wrong. You may be wondering whether you have unused or unwanted prescription drugs at home, who may have access to them and how you can begin to prevent misuse. A good place to start is by taking steps in your own home to change how you think about prescription drugs on a day-to-day basis and examine ways to limit access to your prescriptions by others. 1. Know your options and have a plan before taking any prescription. Discuss with your doctor ways you can manage pain that don’t include taking opioids. If it is the best option for you, be sure to only take them at the dosage and frequency prescribed, follow up with your doctor to review your treatment plan regularly and never share them with others. The CDC has a wealth of information for patients. 2. Lock up your medications. Store prescription opioids in a secure place, out of reach of others (including youth and adult family members, as well as visitors). Ideally, these types of medication would be locked in a storage container to which only you have the combination or key. 3. Keep inventory of your medications. 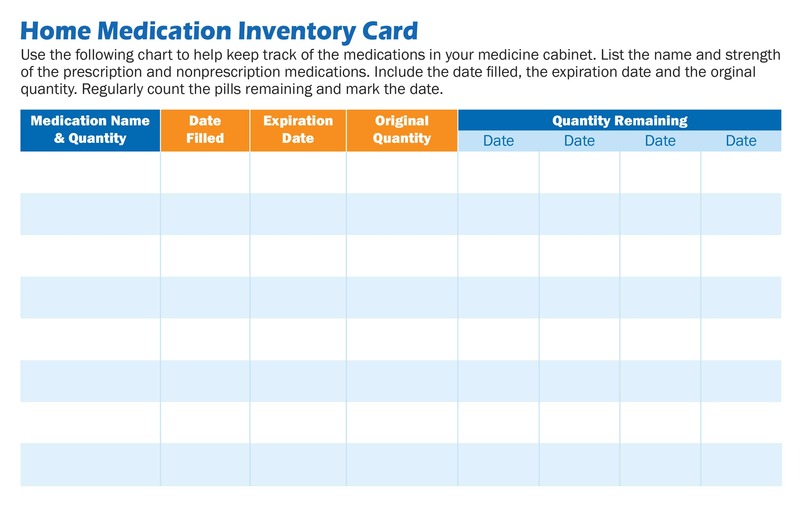 An easy way to keep track of the medications in your home is by using a Home Medication Inventory Cardlike this one from Drug Free Collier. 4. Safely dispose of unused, unwanted or expired medication. The DEA hosts National Prescription Drug Take Back Days twice a year (in April and October). However, if you miss an event, you can also locate a year-round drug disposal collection site near you here. What you should never do is flush medications down the toilet or dump them down the drain. Learn everything you need to know about how to clean out your home medicine cabinet and dispose of your medications safely here.